With the expectation of immediacy in the digital age, it’s no surprise over 75% of American adults use social media. As millions connect daily, social media has become cross-generational and a part of everyday life; those same millions using it to gather daily news and connect with social causes. If harnessed correctly, social media can be the perfect medium for any non-profit organizations volunteer recruitment arsenal. Like most things though, having a well laid plan is necessary, otherwise much of what social media has to offer will be squandered. Considering the amount of technoliteracy required, simply charging the Millennial to post content on social media isn’t a strategy. Adversely, being of an elder generation isn’t an excuse for not having a strategy either. Volunteer administrators are tasked with recruiting, training, staffing, and acknowledging volunteers. At many non-profit organizations, the function of recruitment is reactionary, with volunteer administrators responding to emails, answering phone calls and arranging meetings. 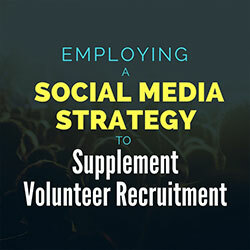 Employing social media allows those recruiting, to be proactive by opening new doors, enlarging the organization’s social network, and increasing the likelihood of onboarding new volunteers. Keep in mind though, every detail from the content, channels you post on, when and how often you post needs to be intentional with a designed purpose. Understanding the purpose is first determined by knowing the ‘why’ of the social media strategy. Whether the goal of the strategy is to generate support for an event or to create a virtual community among volunteers, knowing this goal will shape ‘how’ it’s accomplished. The ‘why’ in this particular case is converting virtual followers into volunteers. For those just starting out, focus on one goal at a time to maximize results before implementing more advanced practices. Focusing on more than one campaign can diminish your social return on investment (ROI), conversion rate of followers to volunteers and your message consistency. Because this process needs to be Inclusive to other programs within the organization you’ll want to avoid creating a strategy on your own. Measure website traffic. Work with your webmaster and determine current traffic rate before implementing the strategy. Continually measure the change in traffic as time progresses. Websites with a social media presence experience nearly 55% more traffic than those without. Followership and social reach. Determine current rate of new followers per month. This only works by having authentic followers (not bought and paid for) on social media. Over time, monitor this to see if there’s an uptick in followers. Building a network of authentic followers will create a community around your organization’s brand. Followers connected to your organization will advocate, share, repost and comment on your content. Frequency of posts. Each social media channel has an optimum posting frequency rate. Measure your efforts against current industry standards, using that as a starting point. Identify what works best, readjusting frequency as needed based on audience feedback. Finding the optimum post rate will allow for increased visibility of content, while mitigating risk of ‘content shock,’ or audience fatigue from over posting. Social media is about interaction. Go beyond ‘numbers’ and dissect the feedback you receive. Be cognizant of language used by the audience when engaging and compare this over time to quantify effectiveness. What you say about your organization may (or may not) be what others are sharing through their social networks. Keeping interaction conversational with followers will humanize your organization’s virtual presence, creating authenticity and trust. It will also allow you to keep your finger on the pulse of what’s being shared about the organization. When focusing on volunteers (current and potential) you’ll want to research and understand the population you’re trying to convert. Pay attention to their demographics and where they reside on the social web. Different populations have a tendency to use certain social media channels. Conduct research and seek out the populations you desire. Collect demographics. Send surveys and conduct deep dive of publicly available information about current and potential volunteers. Gather age, gender, location, education, profession, and their sources for news. Collecting data will allow you to segment your outreach and better understand your audience, resulting in stronger virtual connections. Use analytic tools. Monitor click rates and capitalize on how people engage. Consider using Google analytics (similar applications) or paid ads that allow you to track and analyze data. Adopting analytic applications will let you quantify and assess the degree in which your audience engages. This allows you to see what resonates with your audience and hone in on what works. While consistent messaging is important, also consider the way it’s reinterpreted by the audience. Social media is largely ‘social,’ so focus on making the virtual connection. Be sure the recruitment strategy is on message with the overall strategic plan of the organization. Content and logo use should be within the branding and style guidelines that exist, but may need to be modified, allowing engagement to be conversational. Consider color schemes, images, videos and nomenclature. Add keywords for search engine optimization (SEO). Tone and voice should be such that it reaches the broadest audience while being relevant and engaging. Using images and videos will keep your message brief, concise, and visually stimulating, keeping your audience captivated. Use an editorial calendar to plan content that’ll be used on social media and traditional marketing channels. Plan the types of posts, who’s assigned to content creation, due dates and when to publish. Coordinating content, will ensure material is regularly posted for your audience. Be sure content creation and editing are congruent with current organizational branding and style guidelines. Here’s a great editorial calendar template by CoSchedule.com that can be used as a starting point. After you set up an editorial calendar, save yourself a tremendous amount of time and schedule your posts in advance using a dashboard. The employment of a dashboard will allow you to schedule posts on multiple channels simultaneously, collaborate with other team members, analyze results (usually a paid feature), and simultaneously track several campaigns. Research the use of dashboards carefully, as some allow integration between Twitter, LinkedIn, Google+ and Facebook, but some do not. Social media should be used to augment (not replace) traditional means of marketing and outreach. Don’t forget incorporating social media into existing marketing tools. Integrating social media into your website, publications, email newsletters, events and promotional booths will bring your social media presence outside the social web. Because social media takes place 24/7, managing interaction will present challenges. Unless there’s full-time staff whose job is to manage social media, you’ll need the support from others who can commit time to monitoring engagement. Achieve this by assembling a team that can dedicate time to posting and interacting with followers. Ensure team members have visibility of what the others are doing. Create an environment that encourages information sharing to prevent duplication of effort, while facilitating true collaboration. Until your organization can determine significant ROI of your social media strategy, responsibilities of social media management will be a team effort. In the meantime, the team can work on attaining buy-in through shared management. Sum the hours of shared responsibilities, painting a picture of how much dedicated time is necessary to do this successfully. Only after there’s buy-in from leadership will a dedicated staff member be considered to manage social media. Be social. Interact with followers who post and share your content. Like the act of volunteering, the virtual connection should focus on the experience through virtual engagement. Be deliberate with your message while being conversational. Assign a real person (not an auto responder) who can reply promptly while using discretion. Below are some tips to do to this effectively. Transcend formal discussion. Conversational engagement will humanize the organization’s web presence. Go the extra mile and nurture back and forth dialogue that’s honest, authentic and transparent. This will create an intimate and positive conversation, keeping your followers engaged and enthusiastic. Capitalize on the engagement. Create chat sessions, Facebook groups and hashtags that allow followers to provide feedback, advice and commentary. Both successes and failures exhibited by the organization will be noticeable based on what people share through their social media. By creating and owning these outlets, you can post content to drive conversation in a direction advantageous to your goals. Post in real-time. Take advantage of social media and post updates in real time while at events where volunteers are serving. Like a conversation between two people, volunteers will document and record their good (and bad) experiences, sharing them through virtual conversations. If those you’re engaging have a good experience, the conversation that follows will take care of itself. Properly tagging others. ‘Tagged’ followers often times receive an alert notifying them of engagement and will in turn respond, creating conversation. By tagging others, you allow the conversation to be tracked. If it’s not tracked, you lose an ability to analyze the data using third party applications. Listen and continue cycle: Follow the conversation and analyze engagement through the entire lifecycle of the strategy. Use the data to periodically audit the process, making adjustments as needed. Feedback from engagement will contribute back into the process of auditing, setting new benchmarks, targeting and segmenting the audience, generating future content, staying in tune with supporters and strengthening the virtual relationships. For many including myself, it’s hard to remember a life without instant access to the digital world. But in the grand scheme of things, social media is relatively young in age when compared to other marketing tools. There’s a reason traditional marketing tools have stood the test of time. While social media isn’t a ‘fix’ or something to be solely relied on, it’s one of the fastest growing social circles for collaboration with an estimated 20 million new users projected over the next five years. For non-profit organizations that have a limited advertising budget, little visibility and few staff, social media can offer an outlet that levels the playing field against the 1.5 million other organizations competing for the same attention from volunteers. Like starting anything from the bottom, it takes dedicated time (give it an hour a day), deliberate action, fine tuning and most importantly, patience. As your audience grows, so will your conversion rate of authentic followers to volunteers. Jerome Tennille is Certified in Volunteer Administration, currently serving as the Manager of Volunteer Services at Tragedy Assistance Program for Survivors. With over four years in the nonprofit industry, he’s also on the Board of Directors for Peace Through Action USA, a national nonprofit social purpose organization missioned to achieve peace between people and their communities in the United Sates.